Late Tuesday and early Wednesday, U.K. regional carrier Flybe announced the cancelation of approximately five percent of its flights, the majority of which were within the British Isles. It is understood that there is a combination of reasons behind these cancelations including union discussions over potential job losses and or relocations which relate to the carrier’s move away from jets to a more turboprop-based fleet of aircraft as part of its long-term cost-cutting measures. In addition, Flybe blamed an industry-wide shortage of pilots for the cancelations, as well as its own pilots taking holidays, a situation that heavily affected low-cost carrier Ryanair last year. Flybe was put up for sale last year after posting an approximate £20 million loss for the financial year ending March 2017. The company was bought by Connect Airways, a consortium which includes Virgin Atlantic and Stobart Aviation which each hold a 30 percent stake, and Cyrus Capital Partners who are the majority shareholder with a 40 percent stake. The sale to Connect Airways was concluded on February 21 this year for an agreed sum of £2.8 million in cash, an immediate release of £10 million plus a further £10 million to be made available, plus the provision of an £80 million bridging loan, to enable flight operations to continue. (£1.00 = US$1.32 at time of publication). In November 2018, Adria Airways has signed a Memorandum of Understanding with Sukhoi Civil Aircraft Company regarding the long term lease of 15 aircraft type SuperJet 100. 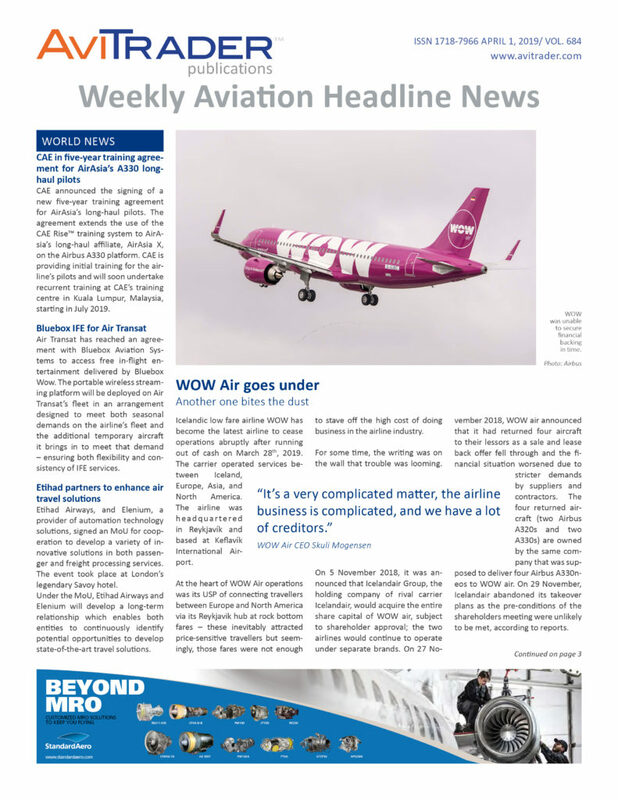 The airline has announced on April 2, that it has not been able to finalize the contractual clauses with the Russian side and therefore the shareholders and management of Adria Airways have decided not to continue the partnership with Sukhoi Civil Aircraft Company and to cancel its order of 15 SuperJets. Domodedovo’s destination network is extending in the summer-autumn period due to additional and new flights to the South of France. On March 31, Moscow Domodedovo Airport launched its summer schedule. It remains in effect until October 26. French Aigle Azur is performing flights from Marseille (France) to Domodedovo Airport starting March 31, with an Airbus A320, twice a week. Marseille is a new destination for both Domodedovo Airport and the Moscow air hub. In the summer-autumn period partner airlines will also offer flights to other cities in the South of France. S7 airlines is going to perform flights to Nice twice a week starting April 28. Ural Airlines is planning to operate flights to Bordeaux and Montpellier 3 times a week, starting respectively June 3 and 5. C&L Aerospace has hired Jarmila Kotkova a seasoned sales strategist, as its Regional Sales Manager for Europe. Kotkova has more than 20 years of experience in logistics, maintenance and parts support in the European regional airline market. from 2014to 2017. During that time, she built strong relationships with European regional airlines by providing aircraft parts, programs and support to fit their needs. All regions reported a contraction in year-on-year demand growth in February 2019 except for Latin America. Asia-Pacific airlines saw demand for air freight contract by 11.6% in February 2019, compared to the same period in 2018. Capacity decreased by 3.7%. North American airlines saw demand contract by 0.7% in February 2019, compared to the same period a year earlier. Capacity increased by 7.1%. European airlines experienced a contraction in freight demand of 1.0% in February 2019 compared to a year ago. Capacity increased by 4.0% year-on-year. Middle Eastern airlines’ freight volumes contracted 1.6% in February 2019 compared to the year-ago period. Capacity increased by 3.1%. Latin American airlines posted the fastest growth of any region in February 2019 versus last year with demand up 2.8%. Capacity increased by 14.1%.African carriers saw freight demand decrease by 8.5% in February 2019 while capacity grew 6.8% year-on-year. SR Technics has successfully completed a galley conversion project for the leasing company AerCap. The SR Technics Engineering team’s innovative proposal to modify the galleys on five Boeing 777-300ERs convinced AerCap to upgrade to the popular ATLAS standard. After a design and certification process, the first installation was completed at the beginning of 2018 and led to the delivery of all five aircraft by the end of the same year. Vertex Aerospace has expanded its global presence by establishing a regional office in Abu Dhabi, United Arab Emirates. The Company received its license to practice business in the UAE March 5, 2019, under its Vertex Global Aerospace business line. week. Steve Suttles, senior director of VGA’s Middle East and Africa business operations, said the Company is pleased to open its first regional office in the UAE. Aireon, the first real-time, global air traffic surveillance system, is fully operational and in trial use over the North Atlantic. This announcement marks a historic milestone for the aviation industry— ushering in a new era of safety and efficiency that will revolutionize the way people fly. The Aireon system is expected to reduce overall flight safety risks by approximately 76% in the North Atlantic according to a joint analysis by NAV Canada and NATS - the first Air Navigation Service Providers (ANSPs) to use the service. Improved visibility and control over previously un-surveilled airspace—especially across oceanic regions—will allow airlines to fly routes at optimal speeds and levels, delivering expected cost savings of up to US$300 per transatlantic flight, plus reducing carbon dioxide emissions by two tonnes per flight, based on an analysis conducted by NATS and the International Civil Aviation Organization (ICAO). Embraer and Nigeria's largest airline Air Peace have signed a firm order for 10 E195-E2 jets. With this order, Air Peace will become the first E-Jets E2 operator in Africa. The contract includes purchase rights for a further 20 E195-E2. With all purchase rights being exercised, the contract has a value of US$ 2.12 billion, based on current list prices. The order will be included in Embraer’s 2019 second-quarter backlog. Air Peace has grown rapidly since it commenced flight operations in 2014 and is now the largest airline in West Africa. The airline intends to address the significant untapped demand in the African market with the E195-E2. AFI KLM E&M was awarded Supplemental Type Certificates (STC) certification authorizing AerCap's three 777s to resume operations. AFI KLM E&M had reconfigured and retrofitted the cabins with Zodiac Aerospace's RAVE IFE system – a world first on Boeing 777-300ERs. AerCap has ordered the cabin retrofit for the three aircraft in October 2017 prior to their transfer to another airline. The retrofit was designed to maximize the aircraft's seating capacity using proven AFI KLM E&M expertise on the 777 product. AFI KLM E&M has already carried out over 100 modification programs on this aircraft type, both for its parent airlines as part of the BEST program, and for third-party customers. Today it holds the record for the configuration with the largest number of seats aboard a 777, at 531 instead of the usual 410-430. AFI KLM E&M personnel adapted to the technical constraints involved in the retrofit, as it was necessary to adapt the RAVE system to the architecture of a 777-300 and develop technical solutions to guarantee IFE operation aboard.